Chad (Arabic:تشاد , Tšad; French: Tchad), officially the Republic of Chad, is a landlocked country in central Africa. It is listed by Foreign Policy as one of the world's top 10 failed states. It borders Libya to the north, Sudan to the east, the Central African Republic to the south, Cameroon and Nigeria to the southwest, and Niger to the west. Due to its distance from the sea and its largely desert climate, the country is sometimes referred to as the "dead heart of Africa". In the north, it contains the Tibesti Mountains, the largest mountain chain in the Sahara desert. Chad was formerly part of the Federation of French Equatorial Africa. The area that is Chad today was once inhabited by politically disconnected groups and tribes. Humanoid skulls and cave paintings of great antiquity have been found there. Relatively weak local kingdoms which developed gradually in the region were later overtaken by the larger and more powerful Kanem-Bornu Empire. From the Middle Ages onwards, Chad was a crossroads for trans-Saharan trade and East-West migration. In 1900, after the battle of Kousséri, Chad became a part of France's colonial system; the French mostly exploiting the south, inhabited predominantly by animists, where they promoted cotton farming and introduced Christianity, while governing the Muslim north through indirect rule. After WWII a process of decolonization began, in which the southern-dominated Chadian Progressive Party prevailed. Its leader, François Tombalbaye, became the country's first president when independence was proclaimed on August 11, 1960. In 1965, Muslim dissatisfaction with Tombalbaye, who was perceived as discriminating against them in favour of southerners, erupted in civil war, beginning a conflict that was to continue without interruption until 1993. This, combined with a severe drought, undermined Tombalbaye's rule and led to the 1975 coup in which the President was killed and replaced by a military junta headed by the southerner Felix Malloum. After a failure to reach an accord with the insurgents, the rebels conquered the capital in 1979 and the state crumbled, leading to the most anarchic phase of the Chadian Civil War. As a further complication, Libya, under Muammar al-Qaddafi, invaded Chad in 1980 to support the pro-Libyan Goukouni Oueddei against his former ally Hissène Habré and to promote an expansionist policy that sought to unify Libya and Chad politically. France and the United States responded, in an attempt to contain Libya's regional ambitions, by aiding Habré, who, in 1982, conquered the capital, ousted Oueddei, and assumed overall control of the country. Despite this victory, Habré's government was weak, accused of brutality and corruption, and seemingly disliked by a majority of Chadians. He was deposed by another Libyan-supported rebel leader Idriss Déby on December 1, 1990. Threatened by constant insurgent activity and several failed coups, Déby attempted national reconciliation, and most rebel groups disbanded. A constitution was approved in 1995, and a year later, Déby won the first multi-party elections in Chad's history. He won a second term five years later. 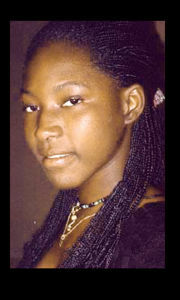 The security situation worsened in 1998, when a new armed insurgency began in the north, led by President Déby's former defence chief, Youssouf Togoïmi, who posed a serious threat to Déby. Weakening of the regime brought coup attempts in 2004 and March 2006, and then, in April, the rebels attacked N'Djamena and were repulsed only after a pitched battle in the streets of the capital. The government also faces widespread opposition following the decision to amend the constitution, so that Déby could run for a third term. In response, all main opposition parties boycotted the May 2006 elections. There is a major risk that the Darfur conflict in Sudan will spread into Chad, with both governments accusing each other of supporting the other's rebels. On December 23, 2005, Chad announced that it was in a "state of war" with Sudan. ; but a peace agreement has been signed at Dakar in July 2006, paving the way for the normalization of Chadian-Sudanese relations. In October 2006, rebel activity once again increased in eastern Chad, with rebels claiming to have seized the town of Am Timan in southeastern Chad on October 23, 2006. Amidst fears of another attack on the capital, the Chadian military has increased its presence in N'Djamena. Once again, the Chadian government has claimed that the rebels are supported by Sudan, a claim the Khartoum government denies. On November 25, 2006, rebels captured the eastern town of Abeche, capital of Ouaddaï Department and centre for humanitarian aid to the Darfur region in Sudan. On the same day, a separate rebel group Rally of Democratic Forces had captured Biltine. On November 26, 2006, the Chadian government claimed to have recaptured both towns, although rebels still claimed control of Biltine. Government buildings and humanitarian aid offices in Abeche were said to have been looted. The Chadian govenment denied a warning issued by the French Embassy in N'Djamena that a group of rebels were making its way through Batha prefecture in central Chad. 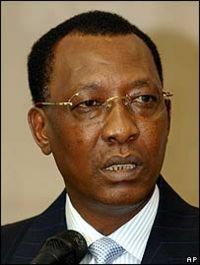 The President of Chad, Idriss Déby. Politics of Chad takes place in a framework of a presidential republic, whereby the President of Chad is both head of state and head of government. Executive power is exercised by the government. Legislative power is vested in both the government and parliament. The political system operates under a constitution established in 1996, but a strong executive branch headed by president Idriss Déby has held power since 1990. Since 2002, Chad has been divided into 18 regions, which are subdivided into 52 departments and further divided into 348 sub-prefectures. Implementation of the new plan has been slow on the ground, however. The regions approximately correspond with 14 prefectures which existed up to 1999. The regions include: Batha, Bourkou-Ennedi-Tibesti, Chari-Baguirmi, Guéra, Hadjer-Lamis (previously part of the Chari-Baguirmi Prefecture), Kanem, Lac, Logone Occidental, Logone Oriental, Mandoul (previously part of the Moyen-Chari Prefecture), Mayo-Kebbi Est (previously part of Mayo-Kebbi), Mayo-Kebbi Ouest (previously part of Mayo-Kebbi), Moyen-Chari, Ndjamena, Ouaddaï, Salamat, Tandjilé, and Wadi Fira (previously Biltine Prefecture). At 495,722 mi² (1,284,000 km² ), Chad is the world's 21st-largest country (after Peru). It is comparable in size to Niger, and is nearly twice the size of the US state of Texas. Chad is a landlocked country in north central Africa, lying south of Libya. The country shares 5,968 kilometers (3,708 mi) of border with Cameroon, the Central African Republic, Libya, Niger, Nigeria, and Sudan. Chad has four climatic zones: it has broad, arid plains in the centre, desert in the north, dry mountains in the northwest, and tropical lowlands in the south. Only 3% of Chad is arable land and none of it has permanent crops. Environmental hazards in Chad include hot, dry, dusty harmattan winds in the north, periodic droughts, and locust plagues. Lake Chad, which is in Chad and Cameroon, was once the second-largest lake in Africa but has shrunk dramatically during the last few decades and is now down to less than 10% of its former size. 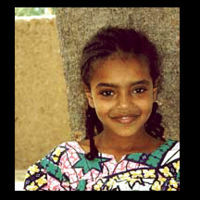 The people of Chad are known as Chadian. 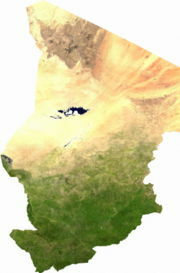 Chad's terrain is dominated by the low-lying Chad Basin (elevation about 250 m / 820 ft), which rises gradually to mountains and plateaus on the north, east, and south. In the east heights of more than 900 metres (3,000 ft) are attained in the Ennedi and Ouaddaï plateaus. The greatest elevations are reached in the Tibesti massif in the north, with a maximum height of 3,415 metres (11,204 ft) at Emi Koussi. The northern half of the republic lies in the Sahara. The only important rivers, the Logone and Chari (Shari), are located in the southwest and flow into Lake Chad. The lake doubles in size during the rainy season. Chad's primarily agricultural economy is being boosted by major oilfield and pipeline developments that began in 2000. Over 80% of Chad's population continues to rely on subsistence farming and stock raising for its livelihood. Cotton, and, in a far lesser measure, cattle and gum arabic, have, until recently, provided the bulk of Chad's export earnings, but Chad began to export oil in 2003 from three oilfields near Doba. It has been estimated that income from oil increased Chad's per capita GDP by 40% in 2004, and may double it in 2005. Chad's economy has long been handicapped by its landlocked position, poor internal communications, high energy costs, scarce water resources and a history of instability. Until now, Chad has relied on foreign assistance and foreign capital for most public and private sector investment projects but oil income will transform government finances. A consortium, led by ExxonMobil, and with the participation of Chevron and Petronas, invested $3.7 billion to develop oil reserves estimated at 1 billion barrels (0.2 km³) in southern Chad, and Chad became an oil-producing country in 2003, with the completion of a pipeline (financed in part by the World Bank) linking its southern oilfields to terminals on the Atlantic coast via neighbouring Cameroon. Chad hopes to avoid the waste and corruption experienced in some other African oil-producing countries; as a condition of its assistance, the World Bank has insisted on a new law which requires that 80% of oil revenues will be spent on development projects. However, in January 2006 the World Bank suspended its loan program to Chad, in reaction to the Chadian decision to "relax" laws governing the spending of oil money. Chad's response is that the World Bank is using Chad as a test subject for different management styles. This suspension of loans further exacerbated Chad's financial problems, which have seen multiple strikes by government workers, teachers and doctors, leading to drastically-shortened school years and a shortage of health care in recent years. In an attempt to address the problem, on July 14, 2006, representatives from the World Bank and the Government of Chad signed a memorandum of understanding under which the Government of Chad committed 70 percent of its budget spending to priority poverty reduction programs, and provided for long-term growth and opportunity by creating a stabilization fund. The government pledged to enhance transparency and accountability with a new pledge of support for the role of the Collège, Chad's independent oil revenue oversight authority. Provided stability is maintained, the outlook for Chad's economy is now better than it has ever been, although government corruption and continued lack of pay to government-employed fonctionnaires still pose significant obstacles to the country's development. It is known that further reserves of oil exist within the country, in addition to the oilfields that are already being exploited. On August 26, 2006, Chad ordered Chevron and Petronas, which combined handle over 60 percent of Chad's oil, out of the country, claiming that they refused to pay their taxes, in the amount of 250 billion CFA Francs (450 million U.S. dollars). Chadian president, Idriss Déby, said that "Chad with Exxon will manage its oil while waiting to find a solution with the two other partners." A new Chadian national oil company was set to become a partner in the ExxonMobil-Chevron-Petronas consortium, with ExxonMobil's share at 40 percent, Petronas at 35 percent, Chevron at 25 percent and Chad at 12.5 percent (as well as taxes). Chad's 12.5 percent share of its multibillion oil industry compares poorly with the 80 percent oil proceeds seen by countries such as Nigeria. On August 28, Déby suspended Oil Minister Mahmat Hassan Nasser, Planning Minister Mahmat Ali Hassan and Livestock Minister Mockhtar Moussa for their involvement in negotiating the terms of the agreements with Chevron and Petronas. Earlier in August, Chad broke its ties with Taiwan and established relations with the People's Republic of China, a move considered related to bringing investments from Chinese oil companies to the country. On September 12, Chevron has agreed to pay an additional tax in order to maintain its presence in Chad's oil industry. On that day, US Deputy Assistant Secretary of State for the Bureau of African Affairs Don Yamamoto met Prime Minister Pascal Yoadimnadji to discuss the oil dispute as well as the escalating Darfur conflict. There are more than 200 ethnic groups in Chad. Those in the north and east are generally Muslim; most southerners are animists or Christians, although such a north/south division glosses over the complex and nuanced tribal and religious relationships in Chad. Through their long religious and commercial relationships with Sudan and Egypt, many of the peoples in Chad's eastern and central regions have become more or less Arabized, speaking Chadian Arabic (see below) (although typically not literary Arabic) and engaging in many other Arab cultural practices as well. More than three-quarters of the Chadian population is rural. Chad is a very culturally diverse nation. Among the manifestations of this diversity is the extremely large number of languages spoken there. Although the only official languages in Chad are Arabic and French, there are also more than 100 tribal languages spoken and a dialect of Arabic known as Chadian Arabic is the closest thing the country has to a national trade language. Chadian Arabic is a mix of "literary" Arabic, French and local dialects. It differs from the country's official language, literary Arabic, and, while literary Arabic speakers can often understand Chad Arabic, the inverse is not true. Government schools are taught in the official languages, with French typically the language of instruction. Few Chadians other than the educated/traveled elite speak literary Arabic. The largest ethnic group in Chad, the Christian/animist Sara peoples living in the south, only makes up 20% of the population. In central Chad, people are mostly nomadic and pastoralist. The mountainous north has a sparse, mostly Muslim population of mixed backgrounds. Each society in Chad (smaller than the groups described above) has developed their own religion, music, and folklore. The CIA World Factbook estimates that Chad's population is 51% Muslim, 35% Christian, 7% adherents of traditional faiths; 7% adhere to other faiths or are nonreligious. The largest Christian churches are the Roman Catholic Church, the Assemblées Chrétiennes du Tchad, the Eglise Baptiste du Tchad and the Eglises Evangeliques au Tchad.